Looking for the best 3d printer? What about reviews of the top rated 3d printers? With the market exploding with new models and more companies coming on board at a record pace it’s getting tricky choosing which to invest in. We’ve sorted out the top rated models, some of which we cover in our 3d printer reviews, and have narrowed them down to what users say, and we think you’ll agree, are the best 3d printers. What earns a printer the best 3d printer award? We use criteria like user reviews, price, value, reputation, warranty, features, company history, community, cost to operate, ease of use, ease of setup, software options, print quality, print failure rate to judge all the models you see here. As you can imagine, knowing which 3D printer is going to be the best depends on your personal use. We’ve tried to take into consideration the diverse types of folks who could be viewing this page and represent each as best we can. Out of thousands of printers, these made the “Best of” list. Feeling the holiday pinch? We’ll make printer selection EASY as pie! No time to read through endless reviews? Are the holidays quickly closing in on you? Here are our top-selling 3d printers throughout 2016 (and for good reason)! In addition to trying to find a 3d printer by price, some prefer to search by category. We’ve awarded a “best of” for each category which you can find by searching the box below. Getting started in 3d printing is now easier than ever! Unfortunately it can be a bit confusing about which printer to make your first. We’ve learned that when you’re starting out it’s wise to start with something basic. Learn how 3d printers work, start with basic prints. Sure it’s tempting to spend a lot of money or make really complex prints, but it often gives novices a bad experience. If you’re totally green to 3d printing this can be away to test your interest in additive manufacturing and modeling without investing a lot. We’ll keep this list below updated with ready-to-use and kit models that are a really great place to start. They’re backed by good companies, have a good reputation for reliability, ease of use and are affordable. Once you’ve tried 3d printing and are sure you love it or want to grow more, you’re ready to move up to to a hobby or enthusiast printer! Simple and affordable doesn’t get much better than this. If you’re after a kit, this won’t work well for you. The Da Vinci Jr from XYZPrinting is fully assembled and with minor tweaks it’s ready to print right out of the box. Single PLA filament option keeps work simple and fun. Modest build size at 5.9×5.9×5.9 will allow you to print just about anything the size of your hand or smaller so something as large as a coffee cup shouldn’t be a problem. Adults and children can have a blast with the Da Vinci 1.0 Jr making practical things to wild imaginative creations. Easy extruder replacement means clogs and jams aren’t fun-killers. Auto-feed filament and self-leveling bed add to the ease of use. A non-heated build plate is safe for kids. Fast shipping, hassle-free returns, all major credit cards accepted! You simply won’t find a more nuts-and-bolts 3d printer design than the Prusa I3. Completely open source and evolving with every new users who builds one, it’s a fantastic experience to assemble and operate. Constructed from mostly 3d printed components along with a few metal rods, it doesn’t get any simpler, either. If you are looking to feel the true 3d printer experience, this is a fantastic model to start with. A strong community of DIYers and a solid wiki make this kit simple and straightforward. Expect about a half day to full assemble and calibrate the Mendel. All components you’ll need are included in the kit. The included 90 day warranty ensure you’ll have your printer up and running quickly even if a part should be broken or missing. Though a simple kit, the Prusa Mendel has a glass print bed (not heated, but can be modified to add heat), high quality bearings and standard 100 micron resolution. Use any of the common open source software such as Google Sketchup or OpenSCAD and paid software such as Solid Works. For firmware you can use Sprinter or Marlin. Slicing can be done with Slic3r or KISSlicer. Remember you can always jump straight to downloading really good files from places like Thingiverse to get you up and running quickly. A few users did note that they were unimpressed with print resolutions. If this happens to you, check that you have the most current firmware updates, latest slicer updates etc. Often this can be corrected with software. Of course many things can affect print quality, but software can be a ghost that is easily solved. Users say this kit is a great place to get your feet wet in BUILDING a 3d printer, but if you’re wanting to get started quickly then buy something that comes assembled. “Theres no shame” they say. The RepRap is more for those who are focused on learning how a 3d printer works on a fundamental level and enjoy the full experience. Advanced calibration and even some part modification may be needed to get the highest print resolutions and low print failure rates. Printing can be done by PLA and ABS. An optional LCD screen and SD card printing can be added, but aren’t included with this kit. 75% of users give the Mendel a 5 star rating with negative reviews coming mostly from people who got in over their head with a kit, and really weren’t ready for the level of commitment needed to get the printer running smoothly up to and including modifying parts etc. 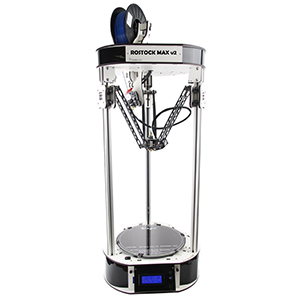 In this category of 3d printers you’ll find a mix of large build kits and other plug-n-play models. While a more confident person could enter the market here and have good success you’ll want to be aware that these models do take a fair aptitude for modeling, electronics and troubleshooting. It’s a good place to get started if you have a little more money to spend, are confident you’ll enjoy the hobby and have an aptitude for these type of electronics. While they have more ability, they also take more upkeep and fine tuning to deliver consistent and high quality prints. This would be a great gift or category for someone with experience in electronics and an aptitude for modeling. This market segment is really growing. We’re bringing you the most proven models here. While it might be tempting to be on the cutting edge getting a unit that was recently produced or just had a really successful kickstart launch we’d rather see folks getting a model that has been around, the bugs have been worked out and they’ll have a great experience. The Dremel Idea Builder 3D Printer has been available for a few months now and is still reasonably priced on Amazon for $999. It rates 4.7 out of 5 stars and has been receiving rave reviews from its first owners. So far, Dremel is succeeding at developing a consumer-ready experience because of the unit’s simplicity of use and economical value for 3D modeling. With its smart self-contained packaging, accessible features and the inexpensive investment cost, the Dremel Idea Builder has captured the hearts and interest of many new users and has >promptly become the 3D desktop printer for the masses. Rumor is that the Idea Builder is a Flashforge Dreamer with a single extruder. If true, then you’re in good hands. Flashforge makes top of the line 3d printers. Dremel, a leader in innovation, works hand in hand with other prominent manufacturers to create products that make people’s lives easier and more interesting. The company has long manufactured quality tools and products in partnership with many associates worldwide. 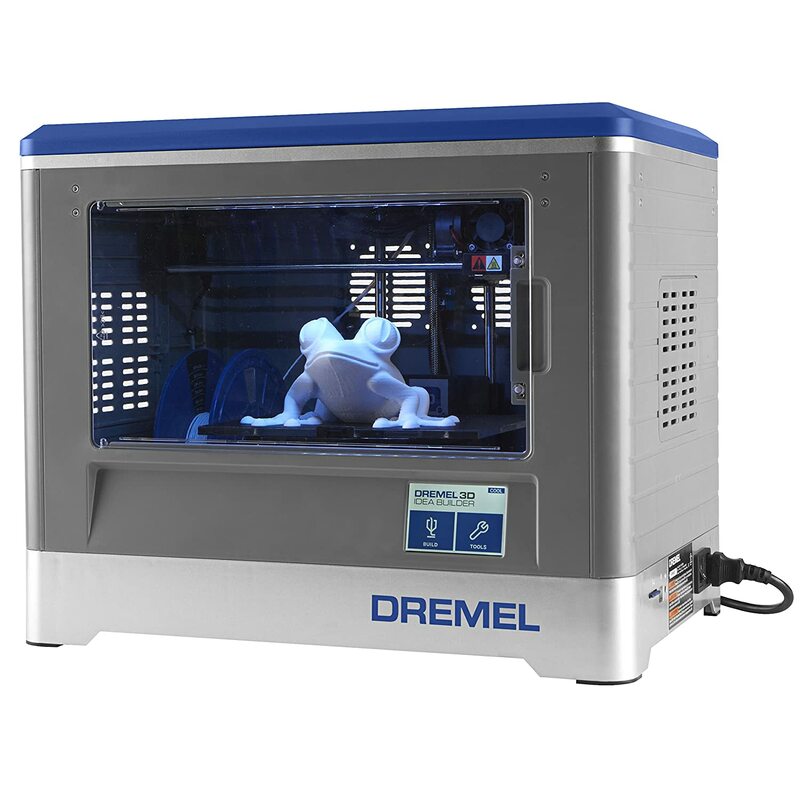 The Dremel Idea Builder was envisioned alongside Flashforge, a Chinese manufacturer noted for >Replicator clones and many of the most popular 3d printers >in several categories. The Dremel Idea Builder is fast becoming popular because it is easy to install and utilize. True to quality service, Dremel produced a well-organized, comprehensive, easy-to-understand manual that not only explains how the printer will be set-up but also introduces the exciting adventure of 3D printing to new users through a detailed glossary. Many consumers love the “unboxing” experience. Just get it out of the lightweight self-contained package, take out the detachable blue lids and the removable side panels, and the Idea Builder is ready to use. The first-time user will find that that the Dremel Idea Builder is simple and undemanding. Once it is out of the box, loading the PLA filament is easy: put the spool on an arm and locks it in place then slide it to the printer head, plug the printer into power, go to the filament and choose load. From there it will be quite effortless to follow instructions in making your very first 3d print! Built off a fun and interesting delta platform, the Rostock Max v2 by SeeMeCNC is fun to watch with its robot like motions as well as a high quality kit ready for the DIY builder to dive into. Massive 7.75x11x14.75 build volume separates this kit from other smaller models. Expect to spend about 20 hours if you’re a seasoned tinkerer. All parts are included. Can use any 1.75mm filament. Proven power ATX power supply and RAMBo electronics round of solid electronics. All parts and tools to build are included. You’ll even need to print a couple parts to complete the assembly (instructions included). Users recommend using glue sticks and a print removal tool (now included) for the best experience! Find a strong helpful community on their forums and all the downloads you’ll need the SeeMeCNC website. 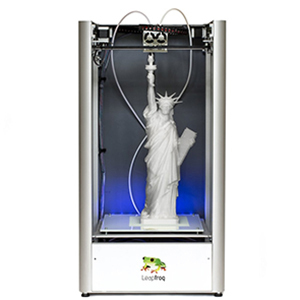 Fun and easy are two words you could use describe the Da Vinci 2.0 3d printer. Offering not just one color, but two for added depth and character to your prints is now offered in a simple, compact and affordable 3d printer. User reviews are a bit all over the place as it seems some have trouble with the software, but say the printer is a good piece of equipment. As with any piece of technology, there will be a learning curve. The Davinci 1.0 had excellent reviews and Da Vinci has stepped up the game with the 2.0 offering features like a heated build plate (reduces print failures) and dual extruders. It’ll print in ABS and PLA, but now they are using a proprietary cartridge. Expect to take some time to learn the machine. Users recommend disconnecting it from your router when printing so as to free yourself from proprietary filament lockdown (backlash from previously allowing open source filaments). This is an entry level model at a comparatively low price, so don’t expect production quality. It’s a great hobby level printer. An all metal enclosure helps the UP! Mini 3D printer create high resolution objects in available ABS and PLA filaments. Resolutions are adjustable to as fine as 200mm (0.20 microns). Users tell us that it’s a great printer, but not for someone who will be printing often or even non-stop, like a business. This printer is simple, the software works well, although lacks controls available on other models such as bed and hot end temperature control. UP! has seen many improvements of late which are getting more positive reviews such as an improved build plate design and more stable software. Build volume isn’t the largest at 4.75 x 4.75 x 4.75 inches/120 x 120 x 120 mm (H x W x D) but is able to make many smaller parts smaller than the size of your hand. Versatile software runs on Windows or Mac OS X using very standard STL file that most any CAD (computer aided design) software can output easily. The CAD software isn’t included. You’ll need something like Google Sketchup or a more advanced software. You’ll send the prints via an included USB cable. Using materials that are heat-sensitive can cause a lot of print failures. 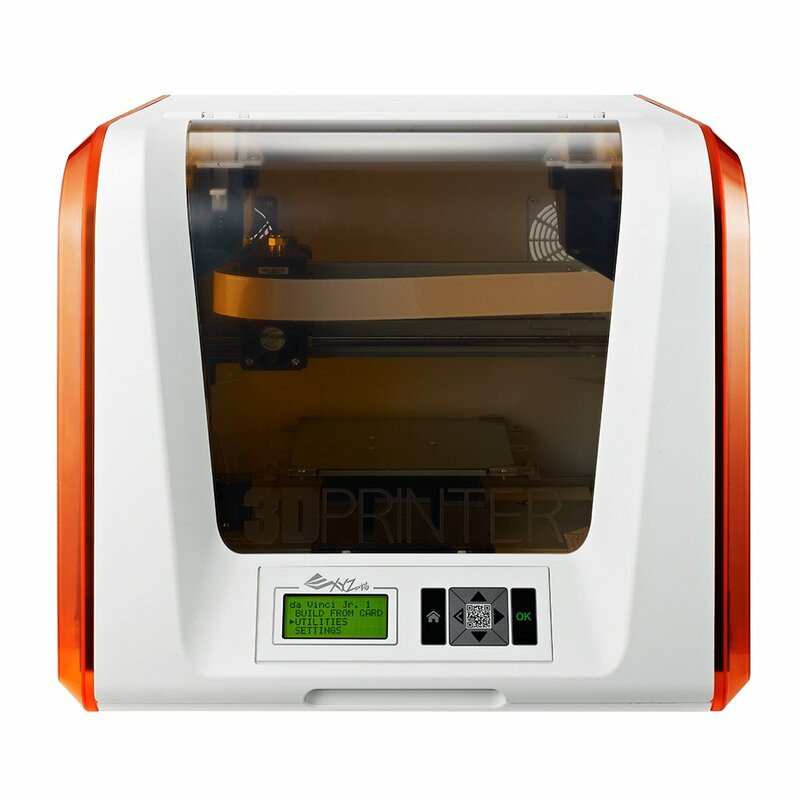 The fully enclosed build chamber protects your prints from drafts and temperature fluctuations. You’ll also have less noise from the printer and odor. The heated build plate reaches 51.4 C degrees and helps keep the first few layers of your builds solid. Users don’t report a lot of failures in this area which is critical to good prints. Seems that even a slight tweak will throw the entire calibration off on the printer so keeping it stable and firmly stationed during prints is vital. It won’t print the largest parts so if you want to print thinks like multi rotor parts or things more than half the size of your hand, you’ll want to look at another model with better volume. 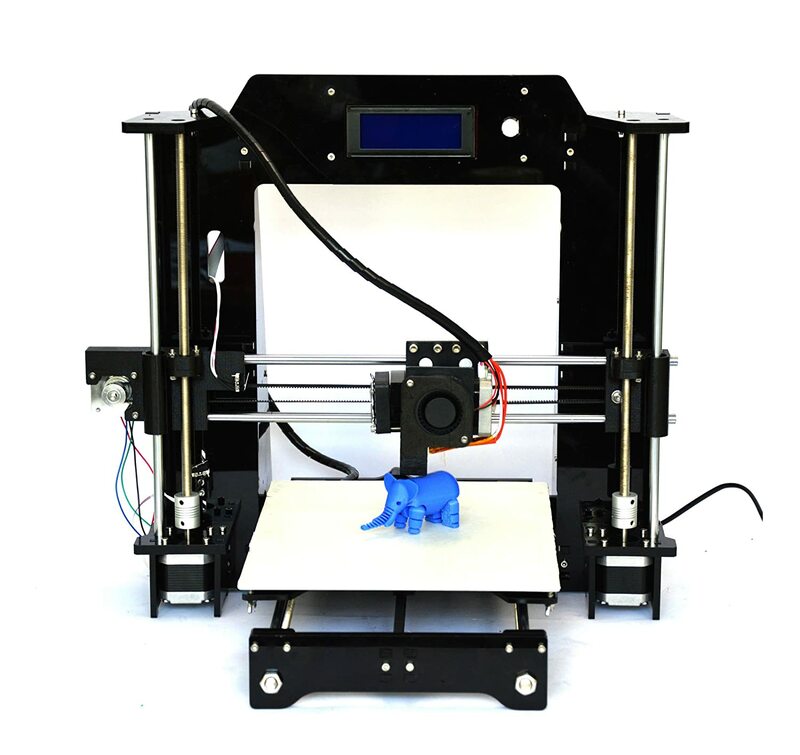 People are building many very fun, practical and interested projects with great success and this printer overall gets a 4+ star rating with over 53 reviews. Time to first print is short and low-hassle which makes this a great started printer! Excellent stepper motors and good quality bearings are giving users smooth prints, low noise and long life. Some have complained the warranty setup process is a bit over complicated, but support is good. If you’re here for a model in the $2000 and under range you’re in very good company! Some of the highest rated printers available in the sub-commercial range can be found in this budget range. For example Makergear has by far one of the highest rated single extruder 3d printers that is open source and prints in very high quality. This might not be the best place for someone completely new to 3d printing as the financial and experience commitment are higher. Getting the most from these models isn’t hard, but you’ll want to be sure you understand how to connect with your community, ask for help and are open to fine tuning. Once these models are dialed in they can produce large and high quality prints in several popular filaments. We’ll say this again that there are a vast number of 3d printers that are coming on the market and that have been around for a short time. We’re only featuring printers in this category with a reputation for being solid investments, producing great results and overall have strong communities, strong companies behind them and will be what you expect. 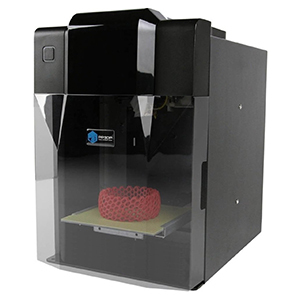 As other models prove themselves we’ll consider them for the top of the line 3d printers list. Until then we’d rather recommend to you models that deserve the title loud and clear. This is the second iteration in the Makergear family of 3D printers and shows that what they improved made a great product even better. Having nothing but good things (okay there are a couple bad things) to report from users means the MakerGear M2, unlike SO MANY 3D printers, is actually doing what people expect and not creating endless headaches. Something that is somewhat priceless at this stage of 3D printer development. This printer is right up there will the other industry leading 3D printers for build volume. At 8 x 10 x 8 inches you’ll have plenty of room to tackle tall projects as well as wide. Having an open build area helps you keep a close eye on the project as it prints and ensure things are going well. This is extremely helpful with PLA as it works best when the project is cooled as it is built. For ABS specifically the heated build plate is a major bonus, but should be expected on any printer at or near this price point. You can expect prints good enough to generate income from this printer, far beyond that of hobby level printers. Nozzle thickness is slightly smaller than most at just 0.35mm which enables the printer to achieve higher resolution in combination with a very precise Z layer adjustment all the way down to .0025mm. Users report that out of the box the MakerGear M2 is up and running quickly and producing quality prints so no need to monkey with speed and quality settings unless you want to take learn what the settings can do. Naturally you’ll want to do this after owning yours for a while. Even at the higher-than-some price point, many first time 3D printing enthusiasts as well as veterans are liking the M2 because it just works. “It’s what I hoped 3D printing would be”, commented one user. Apparently for those who have owned one or more other 3D prints it’s just a piece of cake and almost “no comparison” as another user said. The FlashForge Creator Pro is the next iteration in the family of FlashForge 3D Printers. In short FlashForge is known for consistent quality and has a reputation for ease of use, quality prints and satisfied customers. The Creator Pro is no different. Listening to customers and finding small areas where they can improve their product are trademarks of the FlashForge 3D printer family. At 5 liters this FlashForge printer is no slouch when it comes to large projects. The build envelope measures 225mm (w) x 125mm (l) x 150mm (h) and gives plenty of room for oblong projects as well as multi-part 3D prints. Nozzle thickness on the Creator Pro is an industry standard 0.4mm and the layer thickness (accuracy) is adjustable from 0.1-0.3mm giving you complete control over speed and quality. Finding exact printing speeds is often difficult and hard to translate as the size, detail and material will determine speed. Gladly, few users have mentioned any issues with build quality. The Flashforge family of printers has always been among the quietest 3D Printers on the market. Though many other manufactures have complaints about the noise from their units (since many builds an take hours to complete this can be a major annoyance) Flashforge has used quality build components which are quiet to operate even in a home office. 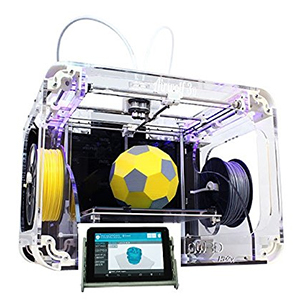 Many beginner 3D Printer enthusiasts start with the Creator Pro with a fantastic experience. In the reviews on Amazon specifically, many comments have been made by first timers that they are VERY glad they chose the Flashforge Creator Profor their first 3D printer. Surely you’ll concur! Setup couldn’t be easier with this printer. The Creator Pro is fully assembled and requires only a few simple steps to get up and running. Follow the setup instructions and you’re ready to being using your new printer! For help you can watch the setup videos provided with the printer. Flashforge has proven themselves to be the value leader for entry and enthusiast level printers. With their newest addition to the dual extruder models, the Dreamer, they’ve really shown they can stay on the edge of design, but keep reliability and affordability. With dual extruders the FlashForge Dreamer can build high resolution models in both PLA and ABS with the enclosed build chamber at resolutions as fine as 100 microns. Easy setup, open source 1.75mm filament and open source software help the Dreamer win Best Dual Extruder 3D Printer. Making entry into the 3D printing community, the FlashForge Creator brings many features typically found on far more expensive models, but at a fair and affordable price. You’ll see exciting features like a dual extruder hot end and heated build plate. A wood and metal frame are rigid and ensure precise printing. Connect and print via the included USB Cable or via an SD Card. Not really for the person just looking for a plug and go 3D printer, the FlashForge Creator has extensive abilities and requires small calibrations for optimal use. If you have basic mechanical abilities and a desire to learn you can get stellar performance from an entry level 3D printer at a fantastic price point. Open source software, design and filament means you’re in full control! Innovate and develop, then share with the community. Find designs, download for free and print immediately. Compatible with all major operating systems and operates from popular files types means you’ll have a diverse set of software options to create, design and publish from. Respectable build volume means you can work on larger projects with ease. A heated build platform will reduce print failures and prevent warping. Dual extruders opens up dual color printing and adds life to your designs. Use color to add depth and character to your designs. The FlashForge Creator has a big brother the FlashForge Creator Pro, but still is a great design and has a proven track record with 3D Printing enthusiasts. If you’re ready to get started this printer will be a great place to start and like so many who owned the FlashForge Creator, you’ll find yourself going back to it again and again to print and play. Create things and share them with others. Inspire and educate. It’s all possible with the Creator 3d Printer from Flashforge. In the $5000 and under category your options open up a lot. However price alone doesn’t in any way guarantee a good 3d printing experience. You’ll start finding different types of printers ranging from FDM (fused deposition modeling) to high resolution resin based printers. You’ll find single and dual extruders, every build volume you can imagine and both open and closed source designs. Our goal here isn’t to make an exhaustive list of models we recommend. Rather to make it very clear which models are worth the investment and will perform the best. As models prove themselves on the market we’ll keep this page updated and add any new or up-and-coming models that make the cut to be on the best 3d printers page. The models below are the best of the best. If you’re looking for something good enough to do commercial and professional work on, but want to keep the budget at a reasonable level the Airwolf AW3D HD would be a great fit. It has all the features you’ll find on even the best of the best desktop 3D printers and then starts to bring in some features you will only find on commercial models such as the filament range, high temp extruders and large build volume. While the AW3D printer might be a bit more complicated due to its roots in the RepRap open source design once calibrated and ready to print it can achieve resolutions as fine as 50 microns which will produce high quality prints and can do so with filaments the other prints can’t dream of. Built to be upgraded and improved means you’ll likely never outgrow the Airwolf 3D Printer HD, but can add components and features as you grow into it’s abilities or the need arises. The RAMBo circuit board is a solid piece of hardware and will provide years of service. Jam Resisant high temperature hot ends (extruders) mean less failed prints and more variety again in filaments. This one component is something you want to get right and the include .50 orafice head that is included will give you excellent resolutions with minimal headaches. An optional .35 orafice head is available for even finer resolution. Though Airwolf doesn’t have a big flashy community like many of the big named companies, you’ll find many AW3D HD owners on all the communities sharing knowledge, experiences and designs. Look around and be sure to speak up about which model you own to get into the growing group of folks who own these great printers. When we first found this printer we said, “Wow, where has thing thing been hiding? If only Airwolf had all the publicity the other 3D printer companies have this thing would be hard to keep on the shelves.” We hope our work in promoting the AW3D HD will help more and more people become aware of this great additive manufacturing powerhouse! Want 2 foot tall statues? NO PROBLEM! The Creater XL from Leapfrog has the largest (and tallest!) build volume in it’s class. Perfect for classrooms, educators, labs and after school programs the Creatr XL is a taller version of the Creatr and can print up to 23.62 in tall! Statue of liberty? Eiffel Tower? Ancient Egyptian Cistern? You get the idea! Not to mention having dual extruders and access to rare 1.75mm filaments like ABS, PLA, nylon, PVA, lay brick, stainless steel, magnetic, conductive and more the options are plentiful. Able to print full electrical circuits and live on-request training class just add to the awesomeness. 50 micron resolution makes smooth to the touch prints without all the post processing. Calibrated upon delivery and read to print in about 30 minutes. Uses standard STL files so any software from Open Source to Industry Standard can be used. The Zortrax M200 3D Printer had its starts on Kickstarter in 2013 and became noticed when Dell ordered 5,000 units when it was sill in its funding phase. While the Zortrax M200 has a higher price point than other printers, it is almost a plug & play printer because it requires very little setup and the instruction manual is simple to follow. Users report that the M200 is one of the most reliable 3d printers they’ve ever worked on and its print failure rate is extremely low… less than 7% on 60-hour prints to be exact. This is typical for industrial-grade machines, but not so much in the home printing market which really makes the M200 unique. Some might call this a “prosumer”grade printer, and no other printer is a better value for the price. However, if you are a person that just loves to tinker, the closed-source nature of this printer doesn’t offer too many options. It also has a heavily regulated ecosystem which means that you don’t have much flexibility in controlling the temperature, which rules out some of your low-cost materials. Zortrax is taking notes on what consumers want to see in their printer which includes the option to print with dual extruders, more filament options (5 filament options available right now that must be purchased through Zortrax) and more connectivity options. If you’re looking for a reliable, high-quality, industrial-grade printer for a consumer price, then this is a great printer to go with provided you are okay that it isn’t open source. Despite the name, the LulzBot TAZ 5 is a force to be reckoned with. The most striking thing about the TAZ 5 is its minimalistic design. It is a bare frame that holds the moving parts and the build platform. But what it lacks in physical bulk, it makes up in terms in all the available features including a sizable build platform to accommodate models of all shapes and sizes. The settings and controls are more advanced to handle complicated designs. You also have the option to crank it up to a higher resolution for models that require precise moving parts. This, along with fast printing times, has earned the LulzBot TAZ 5 the Bronze Award for Top Ten Reviews. You’ll have relatively few problems when using the TAZ 5 3D Printer as a beginner. It offers more advanced options for experienced users. The printer has an LCD screen that displays the temperature reading allowing you to know if the printer is ready to do its job. The print area measures 10 x 11 x 12 inches, allowing users to print in bigger formats as well as everyday household objects. In terms of printing speed and resolution, the TAZ 5 printer blows most of the competition away. It can reach printing speeds of up to 200 mm/sec at a resolution of 0.075 mm. This is thinner than a normal sheet of paper. Very impressive. Some higher priced desktop 3D printers at nearly twice the price of the TAZ 5 are able to print as fine as .05mm or about 50 microns. This unit assembles quickly off the box as its main unit is packaged intact. All you need to do is to attach several accessories. In the box are the power cables and the filament cartridge. It also comes with a tool bag with everything that you need to put your unit together. The kit arrives bundled with an X-Acto knife, a screwdriver set, and a wire brush. 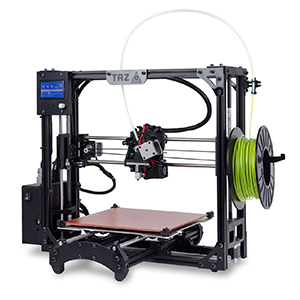 There is no specific design and print software that is required for the Lulzbot TAZ 5. You can use programs like the online Printrun that allows you to control printer settings including position, fill, heat, and speed. The TAZ 5 is the perfect balance of efficiency and affordability. Despite its price tag, it’s other robust features trumps competing 3D printers that offer the same value. The MakerBot Replicator 2is a solidly built and compact 3D printer. Despite its hefty price tag, the MakerBot Replicator 2 3D Printer offers quality design, efficiency, and convenience. However, there are a few issues regarding the printing quality itself, and this will be discussed in detail later on. 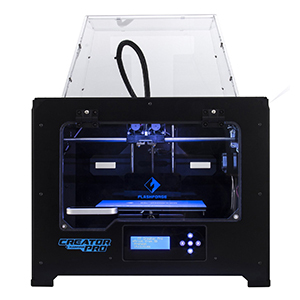 The Replicator 2is a fourth generation design of the original model. Makerbot, the company behind it, is now considered the market leader for home or office-based 3D printing. It is now owned by 3D systems, one of the largest 3D printing manufacturers and 3D imaging specialists in the world. Makerbot and its CEO, Bre Pettis have reached mainstream attention when they were first featured in an original documentary film, Print the Legend. The movie can be viewed on Netflix. Despite an average Amazon rating of 3.5 stars out of 5, the Replicator 2 has garnered mostly positive reviews. Some users are amazed by the results and gave it a full five stars. Others were not so happy, giving it only one star. They mostly complained about the steep learning curve and poor consistency in delivering quality printed results. Others remained neutral and emphasized that the product has its own unique advantages and disadvantages. It is up to the buyer to have a full understanding of this before raising his or her expectations. The most striking thing about the Replicator 2 at first glance is its compact footprint. The manufacturer has delivered its promise of a 3-D printer that is convenient for the home, office, or any area with limited space. The volume specifications without the spool are 19.1 x 12.8 x 14.7 inches. Adding the spool increases the width slightly by 4 inches. The product weighs at a decent 25.4 pounds. Transferring the unit from one area to another should be a breeze when gripped with both hands. Online support for the Replicator 2 is available six days a week from 9 am to 6 pm ET. You can contact them through support@makerbot.com. An online team is on standy-by and ready to help you with your queries. On average it can take a month to gather data, prepare a critical analysis and document a new 3d printer review. Here are some 3d printers’s we’re currently working on reviews for, but haven’t made it to the site page yet. Don’t see your favorite listed here? Comment below or Contact us and tell us why it should be added! Great “best of” categories in this article. Any tips for those who are getting started from scratch? They are a quick learner but have never used a CAD software or 3d printed anything before? Are there some in the budget/beginner/hobbyist category that are just easier to learn than others or maybe there are more tutorials or resources available online that can help? Thanks for stopping by! Great question about getting started. What many don’t know is that you don’t have to be an expert designer to get started in 3d printing. In fact even advanced users often don’t start printing their own designs until they’ve had both a little fun and a little experience with printing. So where do they get models? There are massive communities out there with models available for download for free and others area available for purchase. So really the question usually comes down to budget and experience working with electronics. For some a kit is a great place to start because they get the full experience. Such as the Reprap Prusa I3 which offers a lot of value in a small package and can print most anything a beginner might want. Hopefully that helps you get started DJ! Cheers!